The Sociable Weaver Philetairus socius with its huge communal nest is the iconic feature of arid regions in southern Africa. This week features an example of the 16th and final genus in the weaver family. The Sociable Weaver is in the monotypic genus Philetairus. The meaning of the genus is 'loving companions', so both the genus and specific name refer to the sociable nature of this bird. Adults are distinctive with scaled upperparts and flanks, black bib and brown cap. Juveniles lack the bib. This species is found in open, arid country with scattered trees. It forages on the ground, feeding on seeds and insects, especially harvester termites. They forage within 1.5 km of their nest sites which they occupy year-round. The distribution map (below) is based on The Atlas of southern African Birds, showing the current PHOWN records. There have been very slight range expansions at the edges of its range in some parts (e.g. see here), although the southernmost colony has not changed in 21 years (e.g. see here). 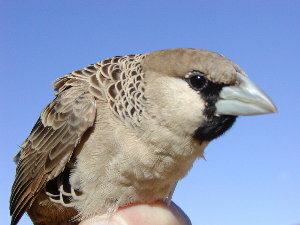 The Sociable Weaver is expected to expand its range as climate change results in an expansion of the arid region in southern Africa. Several subspecies have been described for this species in the past, but are no longer considered valid. The nest of the Sociable Weaver is remarkable. It may be the largest nest in the avian world, although other contenders have been considered. Nests may be up to 7m diameter, with a weight up to 1 ton. The nests are built of dry grass and nest masses would not survive in areas of high rainfall. Birds huddle together in chambers on cold winter nights to raise the temperature within the chamber. During hot summer days, birds shelter in the cool shade of the chambers. Nest sites are mainly camel thorn trees but other tree species are also used, as is the quiver tree (photo below left, phown 1103). Man-made structures are often used, particularly telephone poles. Interesting nest sites were on a dilapidated rondavel (photo below center, phown 1030) and on windmill blades (photo below right, phown 1577). Sociable Weaver nests provide shelter and nest sites for many other birds, particularly the Pygmy Falcon which is dependant on this weaver in southern Africa (e.g. see Tswalu survey). Some other species that regularly roost or breed in the Sociable Weaver nests are Acacia Pied Barbet, Rosy-faced Lovebirds and Red-headed Finches see photos here). Ideally nest records submitted to PHOWN should include a nest count, where possible, to obtain a rough guide to the colony size. For Sociable Weavers, this means counting the individual chambers by walking underneath the nest mass. Presence of snakes, however, is a good reson not to count nest chambers - Cape Cobras often raid eggs and chicks in Sociable Weaver nests, as seen in this photo (left, from phown 2172). There are nearly 500 PHOWN records for this species (see summary), the large number being partially due to intensive surveys (see Tswalu and southern Namibia (and Benfontein)). But many more records are needed, particularly from the edge of its range, to monitor any range changes. Every time you travel into the range of the Sociable Weaver, record the first colony you find and submit to PHOWN. Submit any weaver nest records to PHOWN (PHOtos of Weaver Nests) via the Virtual Museum upload site.